We are very excited to announce Crimson Day has signed a booking agreement with a prominent German booking agent REDLIONMUSIC! We are very much looking forward to working with Redlion to bring Crimson Day to venues across Europe, Scandinavia and the UK in the future. Be sure to keep an eye on our social media to learn about our future tours and shows all around Europe! Second of all: We are now in the pre-production phase of our next release. Currently Crimson Day is doing demos and still writing new material. We are working with Hiili Hiilesmaa, a legendary music producer, to bring forth the best material to our listeners. After pre-production and demoing we will start the production of our next full album, which we are hoping to release either later this year or early 2020, provided we come to an agreement with a label. Stay tuned for news about our future releases! And lastly: our next tour, Baltic Madness Tour, takes place March 28th to March 31st. The tour brings Crimson Day to Latvia and Lithuania for the first time, where we'll play shows at Jelgava, Alytus, Kaunas and Riga. Look up the event nearest to you and join us! We promised you news, now we shall deliver, in Finnish from the link: To the Baltic Sea, and beyond! After a successful Finnish tour CRIMSON DAY, the metal quintet from Tampere, are teaming up with HERALD, an Estonian metal giant! The two bands hit the road together in November 2018 with The Tunnel Vision Tour which takes them on both sides of the Baltic Sea, from Tampere to Tartu! Crimson Day hits the stages of Estonia to spread their gospel of metal. The bands new album At The Mountains Of Madness, praised by critics and audiences alike, took the band all over Finland the past spring. Now it’s time to take on foreign audiences! During the tour the band will play songs from all their records: from the one which started it all, Crimson Day EP to their latest studio album. Herald, established in 2000, is a living legend in Estonian metal circles. The band holds a strong and loyal fan base in their home country with their three studio albums and dozens of live shows. Their latest album, Masin (2015), gained major success and was rewarded with the Best Metal Album-award by the Estonian music awards, as well as the “Single track of the year” -award from Linnaleh-magazine for their single “Kone”. Herald sings in Estonian, and is guaranteed to bring some exotic flair to their already top notch heavy metal. The Tunnel Vision Tour brings Herald to Finland for the first time, so be sure to check them out! Heavy metal wakes the Beast! -November 8th: Dog’s Home, Tampere, Finland, tickets 6 eur. -November 9th: Bar Loose, Helsinki, Finland with special guest Machiane, tickets TBA. -November 10th: Rock N’ Roll Heaven, Tartu, Estonia, tickets TBA. -November 11th: BarBar, Tallinn, Estonia, tickets TBA. AT THE MOUNTAINS OF MADNESS has been out for a couple of months now! If you haven’t already gotten your hands on the album, do it now! Also to help us out, go ahead and follow us on Instagram and Facebook (@crimson.day.band) and in Spotify. To the point: We are currently looking for a booking agent to help us on our future tours and to take us to the next level. The person we are looking for is professional and motivated, and shows genuine interest to Crimson Day. Our goal is to go bigger, better and wider. In addition to Finnish venues, we want to expand our shows abroad, so the person we're looking for has experience in booking shows in Europe as well. Crimson Day has been an active live band for its entire existence. In the last year we've achieved many milestones, such as our first foreign show in Berlin, and a full Finnish tour this winter/spring. Since our formation in 2013 we've played over 60 shows, half of those during the last two years. Until now we've booked our own shows with relatively good success, but to sell even more shows in different venues we need a person with the knowledge, time, resources and networks to make it happen. We strive to progress and growth as a band, and getting a professional booking agent to cooperate with us is a natural step in moving forward. If interested, please contact us via Facebook or e-mail: crimsonday@crimsonday.com. Also, if you know someone who might be interested, please let them know. NEW ALBUM ‘AT THE MOUNTAINS OF MADNESS’ OUT NOW! Crimson Day is proud to present their new studio album At the Mountains of Madness, out now! The sophomore album of the finnish heavy metalists is available on digital services such as Spotify and iTunes, as well as on CD. You can order the CD at Record Shop X, CDON, Swamp Music, or ask at your local record store! The band will celebrate their new album by playing the whole extravaganza live at Jack the Rooster, Tampere, Finland on 19.1.2018. 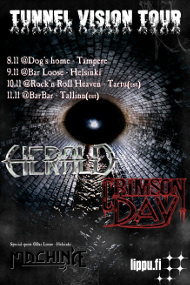 Following the release, Crimson Day will begin their Finnish tour, playing shows from Rovaniemi to Helsinki and between. Be sure to check out upcoming live dates to find the venue closest to you! For more information, review and interview requests and booking, please contact: crimsonday@crimsonday.com Stay heavy and see you soon! Crimson Days highly anticipated sophomore album At The Mountains Of Madness will be released on January 19th, 2018. The band will celebrate the upcoming metal event with a epic release party in Jack The Rooster, Tampere, Finland. Crimson Day will play their new album in its entirety for the first time! Our good friends from All Rise are joining the party and warming the stage. Be sure to check our new promo pictures and artwork from our website, Instagram or Facebook. We’ve still got one gig to do this year, Varjobaari, Tampere 16.12, and then we’ll have a short break before the album comes out. Next spring we’ll be doing gigs all over so stay tuned for more dates! CRIMSON DAY ANNOUNCES NEW RECORD, AT THE MOUNTAINS OF MADNESS, AND HEADS TO GERMANY! After the warm and spectacular reception of Beasts of Prey, Crimson Day is once again ready to release brand new material! This brand new song is called My Last Rites. Born from the pencil of Ari, this new baby presents a heavier edge of Crimson Day, with a more thrashy vibe and heavier riffs than you might be used to. The video to this masterpiece was directed and co-written by a visual media visionary (and a good friend) Jyri Hiltunen, and filmed at Aris hometown Juupajoki. We also had the pleasure of “murdering” a talented young actor Heli Rantala with a dramatic effect. Go and check the video out, you can find the video right here on our website or in YouTube. The song will be available on Spotify and other streaming platforms shortly. About our future plans: For the rest of the year Crimson Day will be staying out of stages and focusing on writing new material. The spring of 2017 will be filled with as much gigs as we can handle, so be sure to stay tuned for our latest news right here on this website or from our Facebook-page. The next chance to see Crimson Day live will be at Bar15, Seinäjoki on 20.1.2017. News about our upcoming releases can be expected sometime during early 2017. So, listen to the song, see the video, stay tuned and most importantly: stay heavy. 15.02.2016 NEW YEAR, NEW SOUND! Crimson Days journey with Valtteri has come to its end. It was one hell of ride, and so much we achieved together. We wish him all the best and fun with his new projects..
"" I’m very excited to be part of Crimson Day and to sing metal with these fantastic people. In my opinion we have hit it off amazingly and I’m looking forward to doing gigs and new material with the guys in the future. I hope our fans and listeners welcome me like the band has welcomed me and I guarantee you will not be disappointed on what we have in store for you. I hope to see hordes of you on our shows! Greetings,Lassi."" 17.10.2015 ORDER OF THE SHADOWS OUT NOW! Go and get your copies! Our debut album entitled Order of the Shadows is now ready to be released. Our upcoming album called Order Of The Shadows has now been recorded and mixing is done as we speak. We made it to semifinals of Kukkona Tunkiolla competition. We will play May 7th in Jack The Rooster (see more details in Live section). Our gig in Eura will be rearranged due to the competition. A new date will be announced shortly. Crimson Day will participate Kukkona Tunkiolla band competition. Our performance will be April 16th in Jack The Rooster. Jyri has decided to quit Crimson Day. He will be replaced by Jesse Liukkonen. Jesse will play his first gig with Crimson Day in Hyvinkää's Bar Zoom February 1st. Crimson Day crew wishes Jyri all the best for his future endeavors! Four live dates have been confirmed for year 2014. We will have three gigs in Tampere (Varjobaari, Ravintola TipTop and Pub A'la Pispala) and one in Hyvinkää (Bar Zoom). Crimson Day EP has now been published through digital distribution. The record can be found from Spotify and iTunes among others. Physical copies are available next week once we are done with cover operation! The record can be bought from us by a fair price of 5 euros. 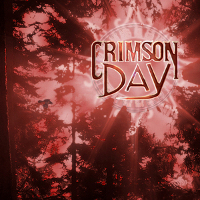 Website of Crimson Day is opened.